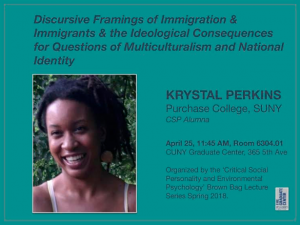 Dr. Krystal Perkins, a CSP alumna, “Discursive framings of immigration and immigrants and the ideological consequences for questions of multiculturalism and national identity”. We will be in Room 6304.01, at 11:45 am. All Brown Bags are free and open to the public! Hope to see you there!